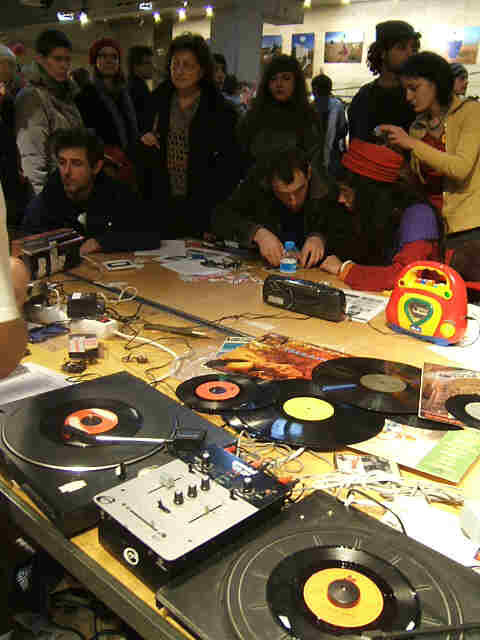 Old Christmas records and tapes are modified by distortion, scratching, stickering , etc. Participants record sounds culled from old christmas records and other sources via microphone onto lengths of tape. These are then cut down and spliced into loops or made into strips. If desired, the loops of several seconds can be spooled into a cassette, and played back on the portable recorders. 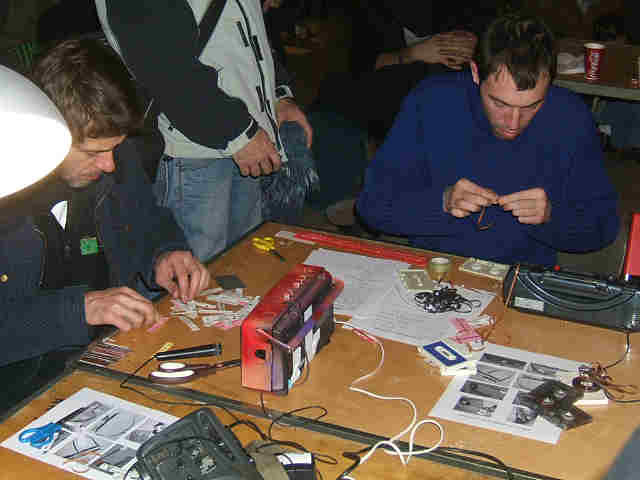 The strips can be played back by modified cassette head readers. The combination of sounds thus produced is again recorded and fed back into fresh loops. Recent economic upheavals have called into question the viability and validity of the market-based model of development, characterised in large part by unsustainable patterns of consumerism. Repetetive, ‘buy – throw away – buy’ consumerist behaviour is a key strategy. A destructive loop. The same is true of the cultural arena. Faced with the internet and the new direct relationships between creators and publics, the response of the industry has been: repetition. The market place is saturated by the familiar: remakes, cover versions. In such conditions there is no room for real imagination, originality or critical discourses. The result is stagnation, cultural decay. Hand in hand with this is increasing technological determinism, dependence on the latest high technology, outdated ever more rapidly, with all the associated patterns of throwaway consumption. Another destructive loop. This workshop uses only recycled material which would otherwise have ended up in the landfill site. Destroy to create: Christmas records provide a source material to deconstruct, distort, and reconstruct, via old cassette tapes, as loops of sound. A sustainable loop.